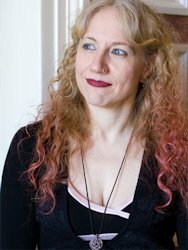 Please welcome Jane Kindred to The Qwillery. Jane is the author of The House of Arkhangel'sk series. The Midnight Court (The House of Arkhangel'sk 2) will be published later this month. If you’ve been following my blog tour, you know that I get a little crazy when it comes to research, and especially for my House of Arkhangel’sk series. In case you aren’t familiar with my Russian obsession, I knew very little about Russia until I got it into my head to write a fantasy version of Anastasia. My writing journey led me not only to take a class on Russian Culture at the local community college, but to begin teaching myself the language as I fell in love with it, and eventually to Russia itself. There are a few things I discovered about Russian tradition both from living there for a month with a host family and from reading obsessively about it that I found particularly endearing. All of these ended up in my books. The tradition of drinking tea seems to infuse every aspect of society. Dostoevsky couldn’t write without it, and now neither can I. (Though he had a real samovar to make his with, and for now, I have to stick with a tea kettle until I find the perfect samovar of my own.) When I was in Russia, we had tea with breakfast, a mid-morning break for tea and sweets, tea with lunch, a mid-afternoon break for tea, and tea before bed. Tea was always served with sugar, no cream, though the traditional method for sweetening is stirring some jam into it. Russians do not believe in going barefoot or stocking-footed in the house. You will get sick. But you don’t wear outdoor shoes in the house either. That would be uncouth. Instead, every Russian household has a rack of tapochki inside the door, house shoes or slippers one puts on after removing one’s outdoor footwear. I brought my own fuzzy pink booty slippers to Russia, which amused my hostess, and I took to wearing them inside the house when I returned to the US, until a housekeeping accident (they were a bit worn by this point, and my cleaning lady thought they were rags) forced their retirement. These are little blini—essentially pancakes, except a bit smaller, less sweet, and fried in more oil. Served with jam and sour cream, they were my favorite breakfast accompaniment to tea. I think I drove my hostess crazy asking for them every day. No matter what they have, Russians will offer it to you gladly when you come for a visit—and many of them have little. I was treated to a trip to the imperial parks and palaces at Pushkin, also known as Tsarskoe Selo, by a relative of my American roommate, simply because she asked if I might come along. Neither of us expected for him to pay for our tickets, but he insisted, and then took us home to his family to serve us a wonderful chicken dinner and homemade cranberry vodka. It’s also a tradition to bring your host a gift when you visit, and I hadn’t realized we’d be going to his house for dinner, so to this day I regret not bringing something to show my gratitude for everything they gave me, a total stranger, simply because it’s what they do. This is specific to St. Petersburg, where I stayed, and is of course a phenomenon of nature and not a tradition, per se, but during the summer months, the sun barely sets in northern Russia. What makes St. Petersburg unique is its celebration of this bounty of light. Ballet and opera and theatre abound, as well as cultural festivals like Alye Parusa, “Scarlet Sails,” which celebrates the city’s graduates with a giant party in the streets, live music, fireworks, and a scarlet-sailed frigate that sails up the brightly lit Neva river past the Winter Palace. Many Russians who live in the city, even those of limited means, have a summer house in the countryside where they retreat on the bright summer weekends. They can be as simple as a one-room cabin, or a two-story home with all the modern conveniences. During Soviet times, families were allotted small plots for these dachas so long as they used a specific percentage of it for growing food, so gardening is still a big part of going to the dacha. I’ve talked about my atheist love affair with the Russian Orthodox Church elsewhere, but it’s the buildings themselves that truly captured my heart. The walls and ceilings and the iconostases are painted with breathtaking icons, with the domes of the cupolas using iconography and light to suggest heaven itself. As a tourist, an atheist, and a feminist, I was nearly brought to tears by the experience of being welcomed inside some of these buildings—wearing the mandatory headscarf—to gawk at the simple, but awe-inspiring beauty. Shortly after the Summer Solstice, the pagan holiday of Ivan Kupala is still celebrated in many parts of Russia. The “Ivan” is for John the Baptist, whose feast the Orthodox Church decided to incorporate into it when they couldn’t stamp it out, while “Kupala” is the pagan god or holiday (there seems to be some debate on the origin of the name) involving water mischief, jumping over bonfires, and seeking the elusive flower of the fern that blooms only at midnight on the night before. What is one of your favorite traditions? Please leave links for Facebook or Twitter. You MUST leave a way to contact you. Who and When: The contest is open to all humans on the planet earth with a mailing address. Contest ends at 11:59pm US Eastern Time on Friday, August 11, 2012. Void where prohibited by law. No purchase necessary. You must be 18 years old or older to enter. Well, my Russian heart did feel pleased and slightly nostalgic with all these traditions. :) When my husband first went to Russia with me he was blown away with the hospitality, and it is my favorite part of Russian mentality by far. Also tea with lemon, which I haven't seen anywhere else. It took me years to stop getting surprised when you're invited to someone's house and not immediately plied with food and drink. My house is always open that way, and I always bring gifts when someone invites me for dinner. Can't help myself. Thank you for a wonderful post! Oh I'll give this a go, why not. A favorite tradition is having Sunday dinners every week with the whole family. I'm not all that big on tradition but I do like the tea serving tradition of turkey. Everywhere you go tiny glasses of sweet tea are brought out to enjoy. It's very relaxing, friendly, and refreshing. Tradition I guess for my family, is tea time or once in Spanish. In Chile we have tea time around six or seven pm. Every since my family moved to the USA 20 years ago , we still do it. I love it because we can all be together at the table as a family. My favourite tradition is wrapping Christmas presents with my sisters. Much Baileys is consumed, and we get sillier and siller the more presents are wrapped. Black Friday is our family's Christmas shopping tradition every year. I have a clam bake every year in October with my family which I love. Thanks for the giveaway! I'm chinese & my fav tradition is the family reunion dinner on the eve of Chinese New Year. It's more precious now for a get together that family members have married & moved away. Family gathering, where we eat and sometime going picnic together!! The family all getting together for the major holidays to eat and chat. Every year my Mom, Grandmother, and myself do the black friday thing. My son called us the three stooges, Grandma died 12-23-10, so me and mom kinda decided we were not going to do it anymore, untill my son told us he would be happy to be our third stooge. So Now the the three of us go. Favourite tradition? Hmm, that's a tough one. At a stretch, I'd have to say... the entire family getting together for the various festival-holidays every year (I'm Indian). My dad has like 6 brothers and one sister in Delhi (three more sisters elsewhere) and they all have at least two kids, most of whom are in Delhi as well and married. So our family get-togethers are rather large!